Sometimes I manage to impress myself bigtime. A while ago, I left a comment on Jimmy’s page on Robot War, about Arena, which is basically* Robot War for the PC. This morning I received an email from Core War fundi John Metcalf, saying that he’s never heard of Arena, and would like to know more. So I thought about it for about half a cup of coffee, remembered which box it was most likely to be, retrieved the box from behind the Puma, and the disk I was looking for was about the tenth disk down (this was the lucky bit — there are about 200 disks in there I guess). 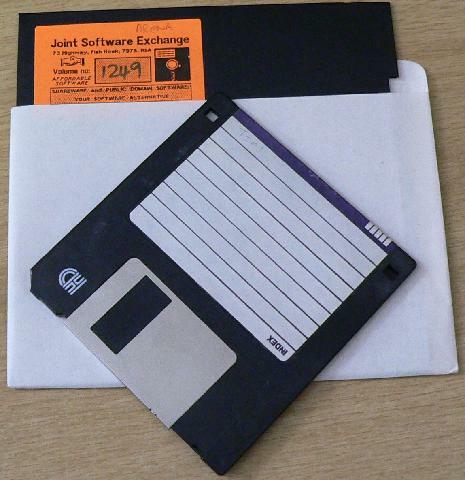 The key point here is that I last used these disks on my father’s PC (the one before the one before the one he has now — it was a 386 on one of those motherboards that still took a 287 coprocessor) back in the early nineties. Call it twenty years plus tax. The fact that I can’t find a notebook battery that I had in my hand day before yesterday is not relevant to the story. So then I had to fire up the third machine on my desktop**, click the KVM over, and copy the files to something my main machine can read. Now I know for a fact that the vast majority of my readers (both of them) are suffering MEGO with a side of TMI. So here’s a cut line for you. It gets geeky on the other side. * Bad pun. Should be assemblerly. You don’t get it. Don’t worry. I’ll explain it. ** Primary machine is a Windoze 2K box. #2 is my Linux box, and #3 is a 486 (or maybe an early Pentium) which mostly boots DOS (with Windows 3.1 if I really need to do that) and runs my Expro. Back in the late eighties, Jean-Paul van Belle ran the Joint Software Exchange out of Fish Hoek. He had a fairly large collection (as you can see, Arena was #1249 in his catalogue) of shareware disks which he copied to floppies (yours, or supplied by him) for a nominal fee. The Simtel / CICA / Walnut Creek CDROMs pretty much put an end to this era. But at the time I got maybe thirty or so disks from him. Good old 360k floppies. So, on to the topic at hand. Arena. If you want to download this, look here. should run on IBM, COMPAQ, Sanyo, Corona, etc. 3:   CMP   :S   -1  ;enemy? And this is pretty much where I gave up playing with Arena. x86 assembler is a necessary evil, I had to commit some as part of my lectures, but I’m an assembler geek of the 6809 / 68000 school and that’s not going to change. Hi, thanks for posting this. I haven’t been able to find any other info online, e.g. when the first version was published, if there’s a newer version, how many issues of The Electric Gladiator were sent out.